On her new album, Highway Hypnosis, the post-punk artist revels in rawness. The introduction is jarring, even stifling, playing out like a demented advertisement while simultaneously poking fun at the fanfare that comes with promoting new music. It also reflects the quietly rebellious, somewhat sardonic spirit of Sneaks, a 23-year-old DIY maverick who doesn’t make things that are conventional or straightforward. She revels in rawness. Sneaks, aka Eva Moolchan, was previously a member of Shitstains, a short-lived band that attracted the attention of Katie Alice Greer, a co-founder of the influential DC label Sister Polygon and a member of the city’s preeminent punk outfit, Priests. Sister Polygon has nurtured the careers of, among others, Baltimore indie darling Snail Mail and the defiant rockers Downtown Boys, and the label took Sneaks on as a solo artist. Her debut, Gymnastics (later reissued by Merge Records), featured 10 threadbare, post-punk songs driven only by a drum machine, bass, and her part-sung, part-spoken-word vocals. In 2017, she released her second effort, It’s a Myth, another short and punchy compendium that proved her willingness to tinker with electronic production and faster tempos. Highway Hypnosis arrives nearly five years after Sneaks began making music as a solo act, and the album finds her at her most freewheeling. She’s abandoned some of her minimalist tendencies and loaded up on textures and looped vocals, like a collage artist compiling assorted odds and ends to make a compelling, if somewhat disorganized, montage. The album, which Sneaks produced alongside her studio engineer, Carlos Hernandez, and the Brooklyn producer Tony Seltzer, boasts the acidity of Gymnastics and the strains of melody from It’s a Myth while expanding her range. After the dark, almost Lynch-like opener, Sneaks pumps up the bpm and bursts right into the art-house cut “The Way It Goes.” She positions the synth-pop haze of “Ecstasy” next, and revisits the punk edge of her first record with “Holy Cow Never Saw a Girl Like Her” toward the album’s end. The closer, “Hong Kong to Amsterdam,” flickers with kinetic club energy. 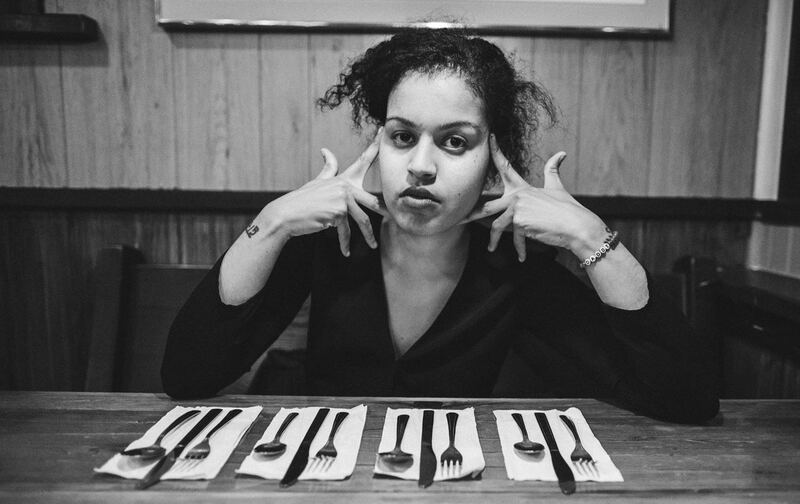 In an interview with Paper magazine, Sneaks recalled that, when she was making Highway Hypnosis, she “was able to kind of just collect a bunch of things, and really reminisce on what I love about music.” The album courses with the kind of movement and dance energy that reflects the influences pushing Sneaks creatively: She spent time in Berlin as a participant in 2018’s Red Bull Music Academy, and some of the city’s live-wire electronic scene has certainly leaked into songs like “Hong Kong to Amsterdam.” But there’s little in the way of personal exposition, likely because narrative isn’t central to her mission of sonic nonconformity. Her messages are indirect, and the details require some digging. If a song titled “Addis” is about her Ethiopian heritage, she obscures any obvious readings with fuzzy percussion and faraway vocals. And when Paper wondered if “Money Don’t Grow on Trees” harbored an anti-capitalist message, Sneaks would only confirm that the song’s carefree abandon came out of the experience of living in Europe, away from the political turmoil in the United States. Sneaks remains elusive. While artists like the Nuyorican rapper Princess Nokia—someone Sneaks calls an inspiration—push the boundaries with confessional lyrics and powerful declarations, Sneaks shows there are plenty of ways to break the rules and, in the words of her current label, Merge Records, join “the resistance forged by queer black feminists who create, explore, empower, conquer, and play bass.” Sneaks doesn’t try to guide her audience; she opens the door to her world and lets them interpret as they wish. Even so, Sneaks doesn’t allow much time for exploration. No song on Highway Hypnosis makes it past the three-minute mark, which is pretty typical of the artist (her last two releases were 14 and 19 minutes long). Brevity carries an undeniable power; one of the best examples came last year when the Philadelphia rapper Tierra Whack dropped Whack World, an album that delivered entire narratives via 15 one-minute tracks. But where Whack jams big ideas into extremely small packages, Sneaks prefers to traffic in fragmented flashes—of what, it’s not always clear. The effect can sometimes feel unfinished and hurried, yet there’s an undeniable spontaneity that Sneaks creates as listeners attempt to keep up with her rapid-fire musings and motivations. She has so many ideas to get across, and her short, stripped-back experiments are one way to tackle them all. If her latest album gets chaotic, it’s because Sneaks welcomes the messiness. She remains confidently punk in her ethos, more interested in spattering paint on a wall than delivering neat concepts to anyone. She’s on her own journey, and on Highway Hypnosis, she’s simply invited listeners along for the ride. Julyssa Lopezis a writer based in Berlin who covers music, art, and culture. Her work has appeared in The Washington Post and The Fader, and on NPR.